Chinese boxer Xu Can said Tuesday he is ready for his WBA featherweight world title bout against Jesus Rojas of Puerto Rico, which will be held on Saturday in Houston, Texas. 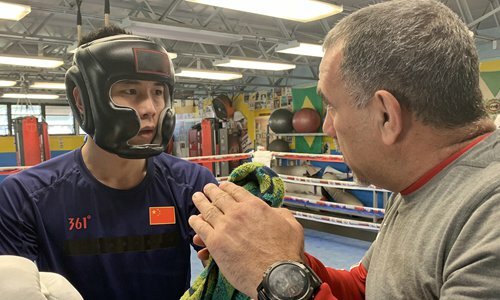 "I think I am physically and mentally fit for the fight after recent preparations," said Xu, who arrived in Houston on Tuesday after an intense training session in Miami. "I'm looking forward to the fight." Xu, 24, has been training with famed coach Pedro Diaz in Miami since January 11. Before his trip to the US, Xu trained with Filipino boxing star Genesis Servania at Beijing's M23 boxing club. Xu still needs to lose some weight to reach the featherweight limit of 126 pounds (57.15 kilograms) before the fight. He is at 130 pounds, according to his club M23. Born in Zixi county in East China's Jiangxi Province, Xu has a record of 15 wins (two KOs) and two defeats. He is currently the highest-ranking Chinese boxer in the featherweight division, according to boxing stats website boxrec.com. Titleholder Rojas has had 13 fights in the US, while Xu has had only one fight there. "I'm confident that Xu will win the golden belt," Diaz said. "Xu has learnt the tactics that we planned to counter Rojas." The fight will be held on Saturday at the Toyota Center in Houston. The arena is no stranger to Chinese sports fans as it is the home court for NBA franchise Houston Rockets where basketball great Yao Ming spent nine stellar years. If he wins, Xu will become a new Chinese world champion, a title which has been vacant since boxers Xiong Chaozhong and Zou Shiming retired.